JNN 04 Jan 2014 Paris : The French Interior Ministry says over a thousand cars were set on fire across France during the deadly New Year’s Eve holiday. According to AFP, Interior Minister Manuel Valls said on Wednesday that 1,067 vehicles were torched in France over New Year’s Eve 2013. Three people also died due to fatal stab wounds, authorities said. This is while; some 53,000 policemen were deployed across the country to try to curtail any violence. The last published figure of burned cars was 1,193 for New Year’s Eve in 2013. 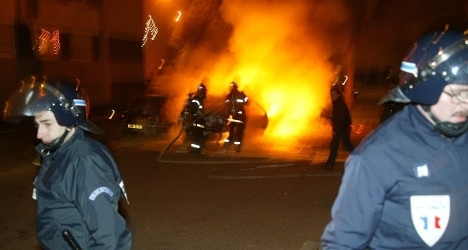 The French government under former president Nicolas Sarkozy did not publish the numbers of burned vehicles on New Year’s Eve in 2010 and 2011 in an attempt to reduce crime. Authorities discovered that the published figures fueled competition between rival gang members in different districts. Last year, however, Minister Valls had promised to publish the figures again. The act of burning vehicles is a tradition that originated in the region around the city of Strasbourg in eastern France during the 1990s as a way to mark the arrival of the New Year. This entry was posted in Europe and tagged France, French Interior Ministry, Interior Minister Manuel Valls, Minister Valls, Nicolas Sarkozy, vehicles. Bookmark the permalink.